We are focused on the radiation detections in food, water and the environment in the radiation conversation EnviroReprter forum. OK, this is important, but I think at this point I would suggest that we all start looking at the larger implications of these detections. 1. There is now a large group of people with compromised immune systems, particularly in the Northern hemisphere. 2. This is a particularly cold Northern Winter. 4. We have large numbers of people traveling, and mixing during the holiday season. 1. Fortify your immune systems, with good food and supplements. 2. Avoid contact with sick people were possible, plus avoid public places in high risk areas. 3. Research methods on how to prevent infection, good hygiene practices, and disinfection techniques. 4. Have enough food and water provisions in place too, so you can shelter in place, if a major epidemic or pandemic eventuates. The above dynamics have statistically increased the chances of this happening. This Google service provides information on worldwide flu trends. Click on the Interactive map for information at your location. PotrBlog has been keeping track of these out breaks and provides independent analysis. If you scroll down through the his blog list, you will find protective measures, plus the latest information on these flu outbreaks. Southern Hemisphere rain swab and rain water tests, for November 2013. Why we can get detections so far south. That was in place all November. Just a couple of showers and storms for November at this location, not much rain mainly dry. I was sent this email from a person informing me about an accidental and surprising detection of radioactivity in lead solder that this person had purchased in Australia. I received the first 12 gram sample late on the 30th of October, and started testing immediately. It took a while to complete multiple tests, plus do research on the test results. In my opinion the sample tests showed the lead solder to be significantly radioactive. On the 8th November I contacted the company that had sold this brand of solder roll here in Australia. I spoke to the Australian product manager. I did this to inform the company of the detection, plus to provide the company with the opportunity to do further investigations into how wide spread and significant this contamination was. The product manager requested a sample for further assessment and testing, which I posted to him on the afternoon of the 8th of November 2013. Later that afternoon a more senior representative phoned me, and freely volunteered the information that this solder was manufactured in China from recycled electronic circuit boards. They had been dealing with this Chinese supplier for over twenty years, and had not had any problems with this product before. They said they would be transparent in their dealings with this detection, and provide feedback. I was sent a replacement roll of solder with a different product name, and it tested clean. 1. The test results had not been received yet. 2. The information conveyed to him, by the scientist doing the testing was it was mainly radioactive lead that was detected. He pointed out there was radioactive lead all around us in the environment, and in all lead. So it was unlikely that this contamination detection would be an issue. In our discussion I pointed out that three contaminated rolls had now been detected in Australia by different people. (four now) In my opinion, the amount of radioactive contamination was significant, and way above what you would normally find in normal lead solder products. 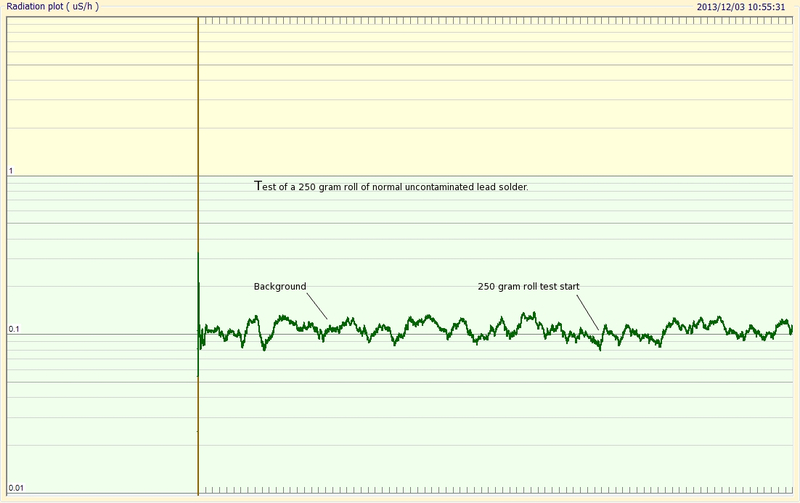 Here is a Geiger counter test of 250 grams of a different brand of lead solder. This is solder roll sent as a replacement for the contaminated roll. 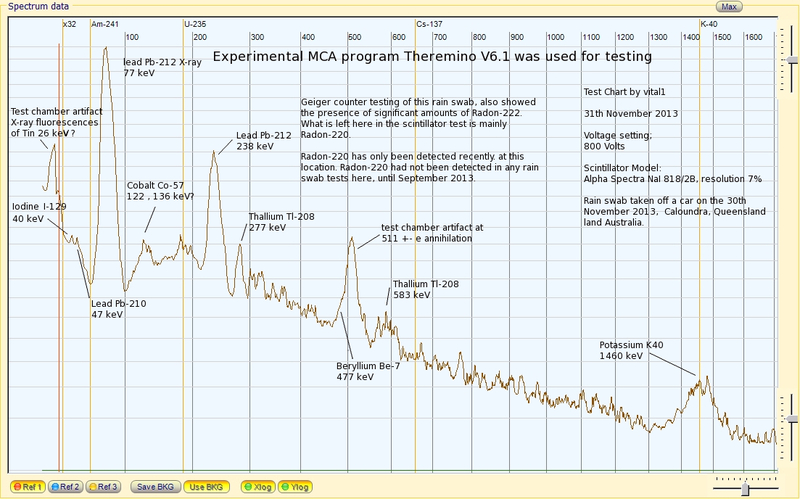 As you can see from the test chart, it is at background level. This is how lead solder you purchase should test! Now compare that test to the test of 64 grams of lead solder, taken off the contaminated roll. There is a very large and obvious difference between the test results of normal solder, and the contaminated roll. 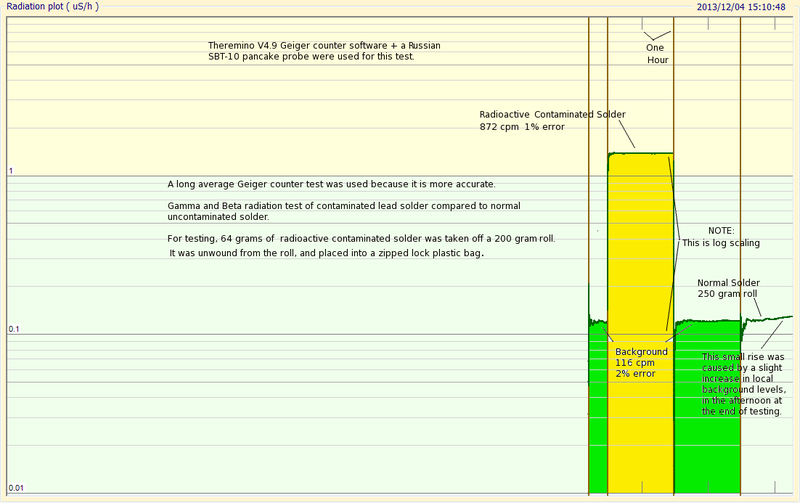 Here is a more scientific long average Geiger counter tested conducted in the same background environment, for comparison. I now have lots of reports from people who have tested a broad range of solder brands. So far, the contaminated detections are restricted to four rolls of this brand purchased in Australia. A contact in New Zealand has reported a clean test for newly purchased solder, including the brand in question. I popped into the branch in Wellington yesterday and bought a 200g roll. I also bought small samples of the 1.0mm version and their lead-less solder. I then wandered up to the university and found a professor who works on such things. He placed the samples in front of his handy survey meter. 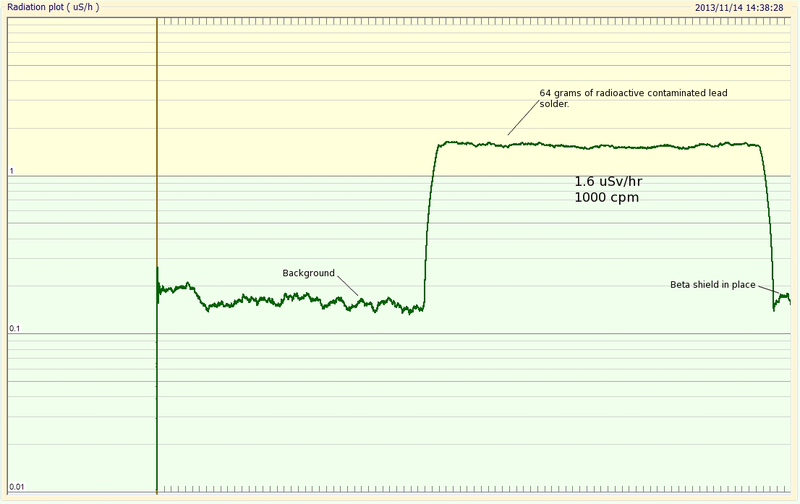 There was no sign of radioactivity above the existing background. This morning I’ve put them in front of my scintillator. Readings decreased by about 10%, perhaps due to the shielding effect of the lead. This evidence now suggests the contaminated solder is restricted to a batch sold in Australia. This is not conclusive. Unfortunately there does not appear to be any batch information provided on the product labeling. 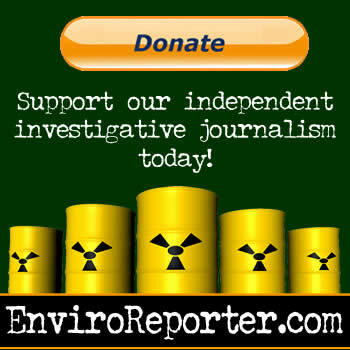 The radioactive contaminated lead solder could present a health risk under these circumstances. 1. If you didn’t wash your hands well after use, or touched other objects before washing your hands. Yes, I know, you should do this even if it was just plain lead solder. 2. Lead X-ray fluorescence, plus the significant amount Beta radiation released, could also be an issue if enough of it was in close proximity, eg. a wearable electronic device, or stored in large amounts. 3. Adults and children potentially breathing in volatilized contaminants on melting when soldering. My big concern is children using this contaminated solder, when working on hobby electronics projects. Their greater potential for hand to mouth contact, and breathing in volatilized contaminants. I have no idea how widely this contaminated lead may have been distributed. Has it been used in the manufacture of other electronic devices, or products that use lead? More investigation is needed to establish if this is the case. If you were building a Geiger counter kit or scintillator equipment using this solder, it would contaminate your project. At present, I would suggest anyone who uses lead solder for electronic projects to test it before use. From the information conveyed to me at present, the company’s interpretation of the hazard appears to be different from mine. At this point I and others have contacted the relevant Government regulators in both Australia and New Zealand. Health and safety complaint forms have been submitted to inform the authorities of the detections. We will have to wait and see what the outcomes are from this process. I will submit a more detail report once this process is complete. The major issue here is Nuclear waste getting into the manufacturing process through poor control, regulation, and corruption. That everyone is a victim when this happens, manufacturer, distributor and consumer, plus the environment. These consumer goods will end up in land fills! Test before use, would be the wisest action at present. Because the first sample sent to me was sent to the manufacturer for further analysis, my contact sent me a larger 64 gram sample for further testing. A Theremino Geiger counter Kit, + Russian SBT-10 pancake tube, was used for Geiger counter testing. The solder sample was in a zip locked plastic bag during testing. The lead in the solder would offer some self shielding. This sample was from the original 200 gram solder roll. The Geiger counter testing of this lead solder detected mostly beta, a significant Alpha presence, plus a small amount of Gamma.